Young Adult Novel Discovery Competition! Serendipity Literary Agency, in collaboration with Gotham Writers' Workshop, is hosting its Third Annual Young Adult Novel Discovery Competition for a chance to win a one-on-one consultation with one of New York's leading YA literary agents! The Grand Prize Winner will have the opportunity to submit an entire manuscript to YA literary agent Regina Brooks and receive a free, 10-week writing course, courtesy of Gotham Writers' Workshop, plus a collection of gourmet teas from Possibiliteas.co. The Top Five Entrants (including the Grand Prize winner) will receive a 15-minute, one-on-one pitch session with Regina Brooks, one of New York’s premier literary agents for young adult books. They will also receive commentary on their submissions by editors at Scholastic, Disney, Harlequin Teen, Random House, Viking, Roaring Brook Press, Sourcebooks, and Kimani Tru and receive a one-year subscription to The Writer magazine. 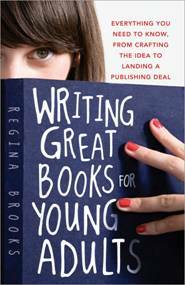 The First 50 Entrants will receive a copy of Writing Great Books for Young Adults by Regina Brooks. Hurry contest ends November 30, 2011!